WESTFORD - Anita M. (Randall) Grant, age 86, of Westford, died peacefully on Thursday, Dec. 13, 2018 at Life Care Center of Nashoba Valley in Littleton. 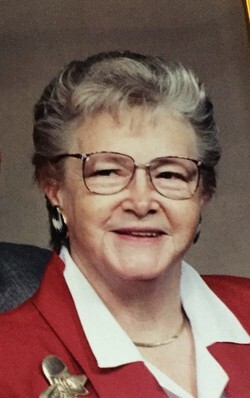 She was the wife of the late Phillip L. Grant with whom she shared forty seven years of marriage until his passing in 1999. She was born in Gardiner, ME, a daughter of the late Frederick and Olive (Crocker) Randall and was educated through the Maine school system. Anita worked for Chestnut Hill Realty in Brookline for twenty five years as a landscaper, locksmith and other various jobs. She also worked at Costco Wholesale in Nashua for four years after her retirement. Anita is survived by her two daughters, Peggy Kellner and her husband, John of Westford and Ramona Lapsley of Stoughton; a son, Henry Grant of Baytown, TX; seven grandchildren, twelve great grandchildren and many nieces and nephews. She was one of nine children who have all pre-deceased her. To share your thoughts and memories of Anita, please click the sign guestbook link.